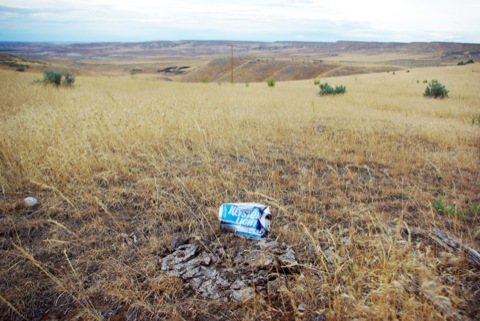 In this 15-minute audio presentation, Mike Hudak explains how ranchers use politicians to intimidate land managers from the U.S. Forest Service and Bureau of Land Management into providing rancher-friendly livestock management that is often detrimental to wildlife. Hudak cites passages from his book Western Turf Wars: The Politics of Public Lands Ranching that illuminate the topic. This is a good, clear explanation of the political realities behind the mismanagement of grazing on our public lands. It assumes little or no background knowledge of the subject. Thanks for the post, Ken. Ken, I think you captured a “cultural” landscape moment more clearly than any I’ve ever seen. Perhaps we should put together a gallery of photographs like this and hold a fundraiser celebrating the western “way of life”, “custom & culture”, “livelihood” and other choice double-speak celebratory phrases. That photo would make a great poster! Just two things missing………a barbed wire fence, and a dead coyote hanging from it. Hey – Ken and Brian – Wasn’t that fine photo taken in the Jarbidge landscape. You know, where the U of I is so busily engaged in “studying” the effects of grazing. Funny thing, though, they never find much of anything other than the U of I Range Department’s solution to everything which is cows, cows, and more cows – particularly those livestock owned by Simplot or Senator Bert Brackett and kin. The problem is very few are turned off by this scene (so whats an occassional beer can?). I’ve had people tell me how the Camus prairie “must look just like when Lewis and Clark came through.” A “western way of life” gallery of photos is needed. Free audio tapes of Hudak’s spiel, distributed at the borders, public service announcements, billboards (like the anti-meth ads), 24 protection for card-carrying WWP folks, of course. Maska, I am thinking of sending some copies of the book to our friends in the Springerville Office and an honorary copies to Uncle Bill’s Bar in Reserve!